If you already have an account for other product of SuperMap, such as http://www.dituhui.com, you can use the account to login to SuperMap Online directly. 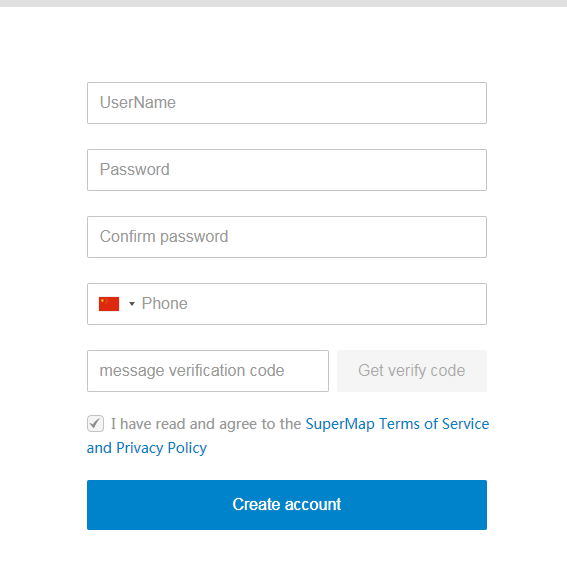 If you do not have any account of SuperMap, you can follow the steps below to create an account: Step1 Register an account using a commonly used email Access http://www.supermapol.com, enter the Register page through the Login button to the right corner of the page. Enter your email address, your nickname, password and then click Register. Within one hour after your registration, you will receive an email for account activation. Login to your email, open the email, click the link in the activation email to activate the account. After the activation of the account, you will be redirected to SuperMap Cloud portal, and the message telling Activation successful will display. Click the Return link to the right side, you will then go back to SuperMap Online. Click the Login button at the top right corner, you can login to SuperMap Online with your registered account. After you successfully login, click My Content to view My Maps, Map Data, My Host, etc. All those tabs are still empty. Now you can Create your own maps online.